A differential pressure meter is used to measure differential pressure in pneumatic, compressor and pump installations, valves, tanks and heating, ventilation and air conditioning (HVAC) systems. 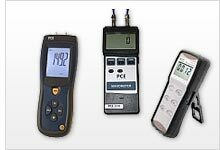 PCE Instruments (PCE) offers portable handheld digital differential pressure meter devices designed to measure the differential pressure of non-explosive, non-corrosive liquids, fluids and gases including air. Most modern differential pressure meter devices offer features such as data hold functionality, an LCD or LED display, internal memory and the ability to transfer data to a computer for evaluating and documenting measurement values. Depending on the model, a differential pressure meter may come with an analog output. 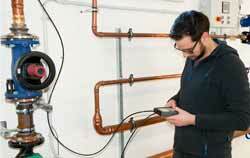 If so, the readings from the meter can be used to regulate or test different systems. Please take into account the various measurement ranges of PCE's differential pressure meter products and whether the devices are suitable for gases or liquids or both. If a differential pressure meter is approved for use with liquids, the meter must only be used with liquids like water or oil. The differential pressure meter cannot be used with strong acids or corrosive agents such as bleach or hydrochloric acid. It is important to note that PCE's differential pressure meter devices do not come with ATEX protection. Furthermore, PCE's differential pressure meter products cannot be used with flammable gases or gases with high concentrations of suspended particles. The differential pressure meter PCE-HVAC 4 is a versatile measuring instrument for the determination of differential pressure, differential temperature and ambient temperature. The measurements of the differential pressure meter PCE-HVAC 4 are via measuring terminals, thermocouples and an internally installed NTC sensor. The differential pressure meter PCE-PDA 01L is a reliable differential pressure gauge for pressure measurement of gases in the range of ± 200 kPa. The differential pressure meter PCE-PDA 01L has many different pressure measuring functions. The Bluetooth differential pressure gauge PCE-BDP 10 is used to quickly and easily check the differential pressure. The Bluetooth differential pressure gauge PCE-BDP 10 finds its application, for example, in the ventilation and air conditioning technology with the help of a smartphone to measure the gas flow pressure or the static pressure. PCE-P01 is a portable handheld digital differential pressure meter or manometer used to measure differential pressure in pneumatic, compressor and pump installations, valves, tanks and heating, ventilation and air conditioning (HVAC) systems. The PCE-P01 displays min / max / average values right on the meter's screen for comparison against current measurement values. PCE-P05 is a portable handheld digital differential pressure meter or manometer used to measure differential pressure in pneumatic, compressor and pump installations, valves, tanks and heating, ventilation and air conditioning (HVAC) systems. The PCE-P05 displays min / max / average values right on the meter's screen for comparison against current measurement values. PCE-P15 is a differential pressure meter used to measure gauge pressure and true differential pressure in pneumatic, hydraulic, compressor and pump installations, valves, tanks and heating, ventilation and air conditioning (HVAC) systems. 11 pressure units are selectable for Imperial and Metric measurement, including bar, mmHg, ozin², kgcm², psi, inH2, kPa, ftH2O|, inHg, cmH2O and mbar. PCE-P30 is a differential pressure meter used to measure gauge pressure and true differential pressure in pneumatic, hydraulic, compressor and pump installations, valves, tanks and heating, ventilation and air conditioning (HVAC) systems. 11 pressure units are selectable for Imperial and Metric measurement, including bar, mmHg, ozin², kgcm², psi, inH2, kPa, ftH2O|, inHg, cmH2O and mbar. PCE-P50 is a differential pressure meter used to measure gauge pressure and true differential pressure in pneumatic, hydraulic, compressor and pump installations, valves, tanks and heating, ventilation and air conditioning (HVAC) systems. 11 pressure units are selectable for Imperial and Metric measurement, including bar, mmHg, ozin², kgcm², psi, inH2, kPa, ftH2O|, inHg, cmH2O and mbar. PCE-917 is a portable handheld digital differential pressure meter or manometer used to measure differential pressure in pneumatic, compressor and pump installations, valves, tanks and heating, ventilation and air conditioning (HVAC) systems. The PCE-917 features a dust-proof, splash-resistant housing, allowing the meter to be used under adverse conditions. PCE-P01 is a portable handheld digital differential pressure meter used to measure differential pressure in pneumatic, compressor and pump installations, valves, tanks and heating, ventilation and air conditioning (HVAC) systems. The PCE-P01 displays min / max / average values right on the meter's screen for comparison against current measurement values. PCE-910 is a portable handheld digital differential pressure meter, gauge or manometer used to measure differential pressure in pneumatic, compressor and pump installations, valves, tanks and heating, ventilation and air conditioning (HVAC) systems. The PCE-910 features a dust-proof, splash-resistant housing, allowing the meter to be used under adverse conditions. PCE-917 is a portable handheld digital differential pressure meter, gauge or manometer used to measure differential pressure in pneumatic, compressor and pump installations, valves, tanks and heating, ventilation and air conditioning (HVAC) systems. The PCE-917 features a dust-proof, splash-resistant housing, allowing the meter to be used under adverse conditions. The differential pressure meter PCE-PDA 100L is a reliable differential pressure gauge for pressure measurement of gases in the range of -100 to +200 kPa. The differential pressure meter PCE-PDA 100L has many different pressure measuring functions. The differential pressure meter PCE-PDA 10L is a reliable differential pressure gauge for pressure measurement of gases in the range of ±20 kPa. The differential pressure meter PCE-PDA 10L has many different pressure measuring functions. The differential pressure meter PCE-PDA 1L is a reliable differential pressure gauge for pressure measurement of gasses in the range of ± 2 kPa. The differential pressure meter PCE-PDA 1L has many different pressure measuring functions. 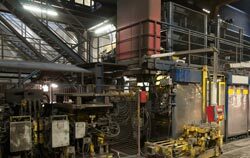 Pressure is one of the crucial parameters, which plays a huge role in many industrial and engineering processes. Differential pressure may be an indicator that some processes are running wrong and immediate adjustment of the system is required; it may point to the problems in pipes, HVAC systems, volume / mass flow processes, pumping etc. A modern differential pressure meter is produced in various versions, and is suitable for application under hard conditions, is resistant to chemicals or influence of other external factors. Application of a differential pressure meter / systems helps to regulate the air volume in the ventilation systems and detect contaminated filters, or, if applied in the heaters, to achieve the optimum combustion mode and better performance of the whole system. Detection of pressure fluctuation / drop points to the failure in a certain system or fault in the process and helps to prevent shutdown of the system. Control and continuous measurement of the liquid level, mass and volume flow provided by the electronic differential pressure meter is safe and reliable. Not always the pressure differences between two parts of the systems are bad. But without application of auxiliary devices an operator cannot detect and correctly evaluate all the processes going on inside of the complex mechanisms and hydraulic, pumping, ventilation, heating etc. system. Differential pressure meter suitable for installation in the most difficult to reach places indicates when this difference is getting negative and even dangerous, and timely troubleshooting may be carried out. The choice of differential pressure meter depends on many parameters, measuring technology and specialization of the enterprise. The truth is that no matter what it goes about: gas, liquid, pressed air etc., static or flowing medium, the pressure parameter must be monitored regularly. For some technological processes just absolute pressure measurement, with no relation to atmospheric pressure. For many, on the contrary, just differential pressure matters and the latter is measured not depending on the absolute one. Another possibility is to measure differential pressure in connection to the atmosphere (for these measurement additional sensors will be required). The fact to remember about the differential pressure is that it never shows the absolute and relative value, its main purpose is to show the difference between the pressures in two different parts of the reservoir, vessel, container. It is easy to underestimate the importance of monitoring particularly this type of pressure by a differential pressure meter, but it is a faulty way. To know what is going on in the system inside is of crucial importance for understanding whether the process flows as required and the dynamics is positive or immediate changes should be made. A quick change of pressure may influence the auxiliary devices applied and bring their settings down. For each system there is a permissible difference between the pressures and to prevent shutdown of the whole system in case of unexpected deviation from the norm the differential pressure regulators / switches are installed to provide stability, since in case of emergency they react immediately. It is especially highly recommended for the HVAC systems. Here, the maximum and minimum permissible pressure and temperature limits as well as pH of the medium under monitoring should not be exceeded. In each particular situation the switches should be selected in accordance with individual parameters, since it happens, for example, that the differential pressure required for the correct technological process is from the beginning beyond the “safe” range of some elements in the regulator. Before applying differential pressure meter and auxiliary regulators, it is necessary to select the elements with the appropriate ranges for every individual task.